At Blissman & Co., we offer the services of a Certified QuickBooks Pro Advisor. We've been helping small businesses learn, use, and customize QuickBooks since 2001. Contact us today to learn more. Whether you want extensive training or just to master one specific task that will make your in-house bookkeeping more efficient, we can provide customized instruction to fit your needs and budget. Contact Blissman & Co. today for affordable and effective QuickBooks training. It's worth repeating, all tax preparers and accounting services are not equal. 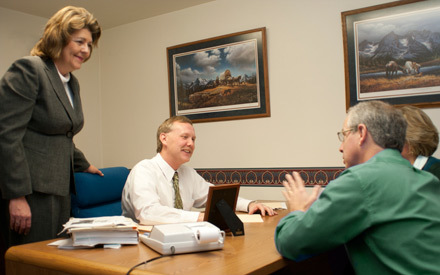 Some of our best clients come from previous accountants that "just put numbers on paper." These discount and big box store accountants did little to check the big picture and look out for the interests of their customer. At Blissman & Co., we not only run the numbers with skilled and experienced precision, we advise and educate our clients in ways that help their businesses succeed. At Blissman & Co., we're your hometown CPA firm, located in Latrobe, PA and serving the Westmoreland County and Pittsburgh areas, and we're ready to demonstrate fierce customer loyalty. We have a commitment to keep you updated about the changing landscape of tax law and how your business can benefit. We'll advise you on tax advice and education, as well as train your staff to perform the specific bookkeeping, payroll, or QuickBooks tasks you want to keep in house. Everything we do at Blissman & Co. is tailor-made to fit your goals, your budget, and both your short and long term needs. Learn more on our Outsourced Accounting page.